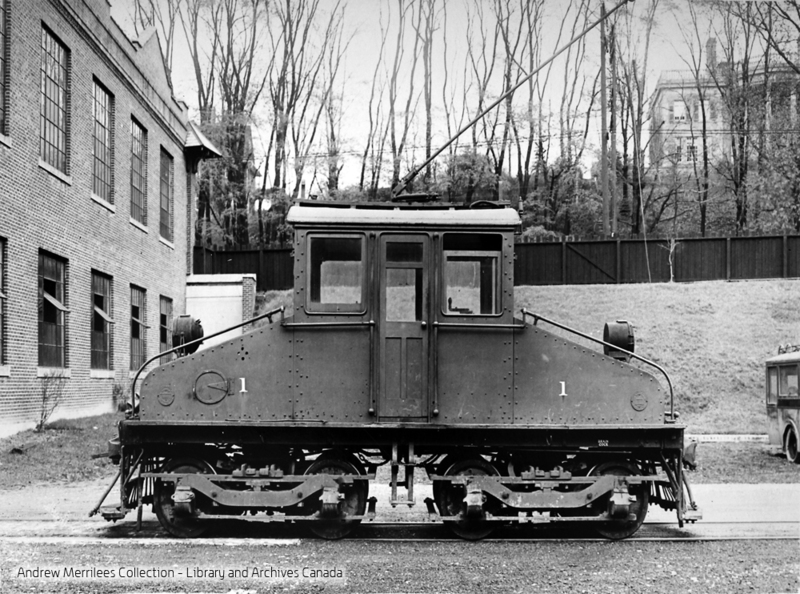 As the name on the front implies, this is Saint-Raphael – a tram engine that operated on the Hôpital St. Jean de Dieu Railway – a hospital and asylum in the Montréal area. The hospital also had a standard gauge electric railway that connected the facility to the outside world. Some searching online turned up a brief article about the railway on the Old Time Trains website. It includes a couple more photos of the tramway and is worth a look. Googling the hospital will also turn up some other sources. I’m fascinated by the trolley poles. I suspect they were required to activate signals. But they could also be there to power an onboard air compressor to lift the flanger blades at crossings. On a non-electric line, that air is supplied by a locomotive – which would also supply propulsion. But this is an electric line, so maybe they took advantage of that? Fortunately, one doesn’t need to know the answer to model The Electric Snowplow and have a wicked conversation piece. The Toronto & York has a lot to offer a modeller looking for a layout subject under wire – including a plethora of interesting equipment. Here’s another piece of arresting snow-fighting equipment from the line – again, via the Andrew Merrilees Collection. 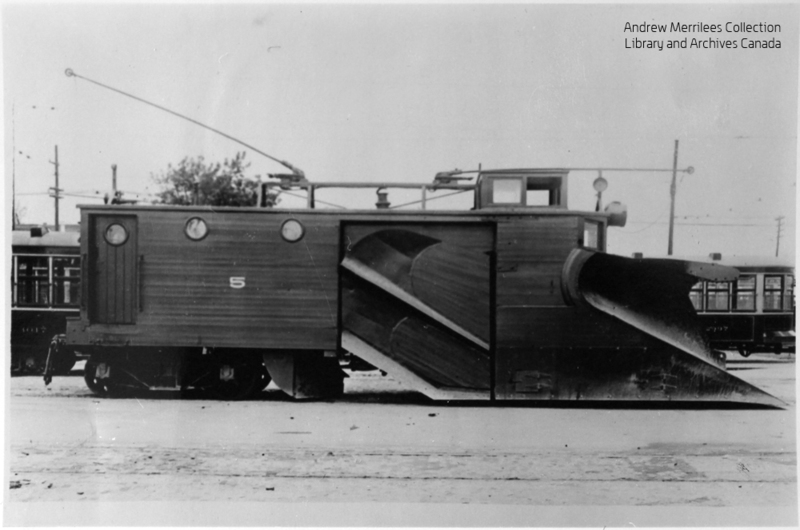 Wow – a Toronto & York Radial Railway (Metropolitan Division) double-ended rotary snow plow, under wire. And with no protection across the blades. Can you image the potential for mayhem on city streets? An unknown photographer shot this image in 1905. According to notes on the back of the photo, the plow was built by J. Coghlan Company and T&Y purchased it secondhand in 1904. The photo was taken on Yonge Street, at the GTR Belt Line Subway, outside the old T&YR Mount Pleasant shop in what is now north Toronto. The gentleman is identified as Joseph Middlebrook. These two pictures were taken at the TTC’s Hillcrest shops at Bathurst Street and Davenport Road in Toronto. Note the weed killer spraying arms on the front (left) end of the flat car, and the hose or air line emerging from the side of the hood on the locomotive and connecting to the flat car. I don’t have details on the steeple cab photo, but the image of it with the weed-killing car was taken on June 6, 1928. Notes on the back of that photo say this car was used on the Lake Simcoe Radial Line between 1928 and 1930. WK-921 was originally a Toronto & York Radial Railway car of the same number, and was scrapped in November 1931 at the Schomberg Junction Wye. 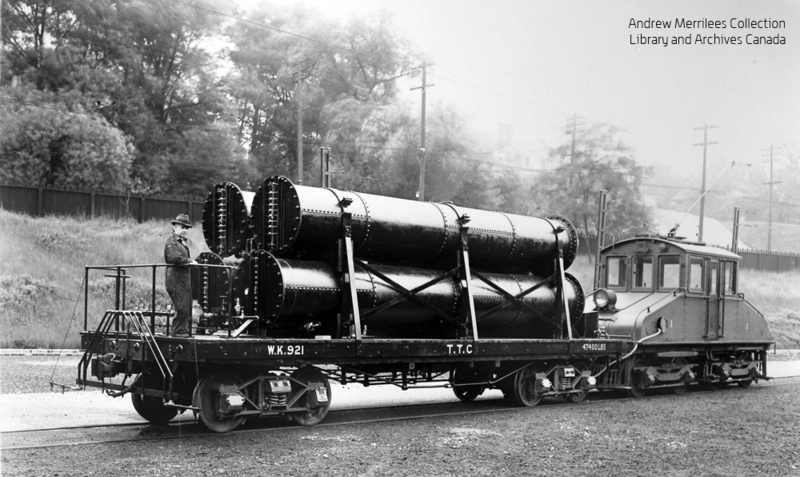 Locomotive number 1 was renumbered LM-1 on February 7, 1931 and sold to Noranda Mines Limited in February 1938. Drawing on a finding aid compiled by Ottawa-area railway historian Colin Churcher, I was searching primarily for images of the Niagara St. Catharines and Toronto Railway and its predecessor lines. As part of the Merrilees collection at LAC, these are free to distribute with proper attribution, so I’ll be sharing my findings on my NS&T blog as time permits. But there were a number of wonderful photos that I couldn’t resist capturing while I was at the archives, and I’ll share those here. To that end, I’ve created the Andrew Merrilees Collection category, so readers may find all posts related to this incredible archive of railway history.